Buildings like The One at Yonge and Bloor and the Mirvish/Gehry complex tend to get all the press, but there are a lot of smaller buildings going up that are worth paying attention to even if they’re not changing the skyline. Two neighbourhoods with a lot of under the radar construction are Kensington Market and Chinatown. Of course, not a lot is happening within Kensington Market, but there’s one big project that will bring in an influx of people: The Alexandra Park revitalization. This complex sits between Dundas and Queen and Cameron to Augusta, just across the street from Kensington Market. The first phase is well underway and when it’s complete, there will be 1540 market units, 333 new rent geared-to-income and 474 refurbished RGI units. That’s going to add a lot more people to the area. When you think about it, Bathurst seems to be underdeveloped – with access to multiple transit lines at every intersection, development at Bathurst and College makes sense. A McDonalds and a parking lot at Bathurst and Dundas now seems like wasted space. Some low-rise condos and towns would fit it with the neighbourhood – and a dedicated line for the Bathurst Streetcar would help move people. 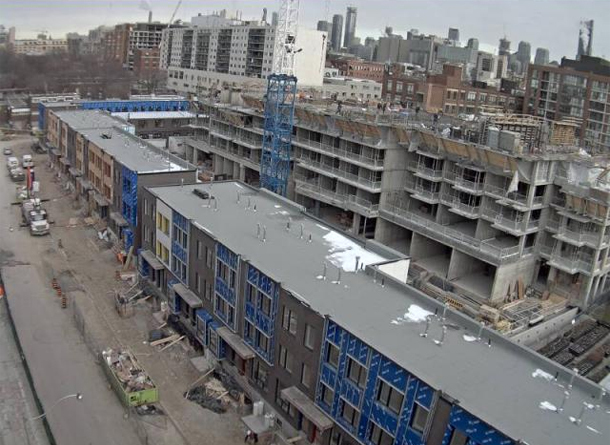 On a smaller scale, there’s a four-storey building going up on the south side of College and Spadina. Those residents will have access to the new Loblaws branded City Market going in at The College, a 15 storey building just a few doors down. With its proximity to U of T, a unit here would make a great investment. This article is part of a series from UrbanToronto about development in different parts of the city. They are great reads for anybody who’s interested in urban planning.